Vampire Cabernet Sauvignon is sourced from several small-berry clones of this traditional Bordeaux varietal, grown in the Paso Robles region of California's Central Coast. An extended growing season, with sunny, moderate daytime temperatures, along with cool summer nights, allows ideal fruit development at this site. Well-drained soils, rich in maritime fossils, add uniquely aromatic components to this fruit-forward wine. Classic, small-lot fermentations, followed by aging with both European and American oak, gives full expression to the rich varietal flavors in this wine. 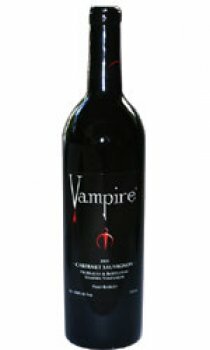 Judiciously blended with small amounts of Merlot for softness, and Syrah for added structure, Vampire's Cabernet displays ripe flavour character and a lovely aroma that will continue to develop with additional time in bottle. Ideal for grilled steaks and chops, or with rich red pasta dishes, Vampire's Cabernet Sauvignon is well-suited for the table, and is a wonderful complement to any fine meal. Amazing with red meat dishes....as with most flavoursome reds, easy to drink, goes down all too quickly. Great wine, soft flavours, but still strong enough, quality.